Symptoms: Ball trough solenoid not working — ball not delivered to shooting lane. For some reason, this past week I’ve gotten a lot of Stern/Sega pinball machine service calls, and all machines are roughly the same era. I started a game and no ball was delivered to the shooting lane. The Dot Matrix Display (DMD) indicated it was ball 1, so the computer thought the ball should have been there. I checked the flippers and they weren’t working either. At this point, I suspected a blown fuse. The flippers, pop bumpers, vertical up-kickers, and ball trough solenoids all are “high current” solenoids and run on 50 volts DC. I checked fuse F21 on the IO Power Driver board and it was blown. F21 is a 3 amp slow-blow (time delay) fuse for the 50 volt power supply used on these high current solenoids. 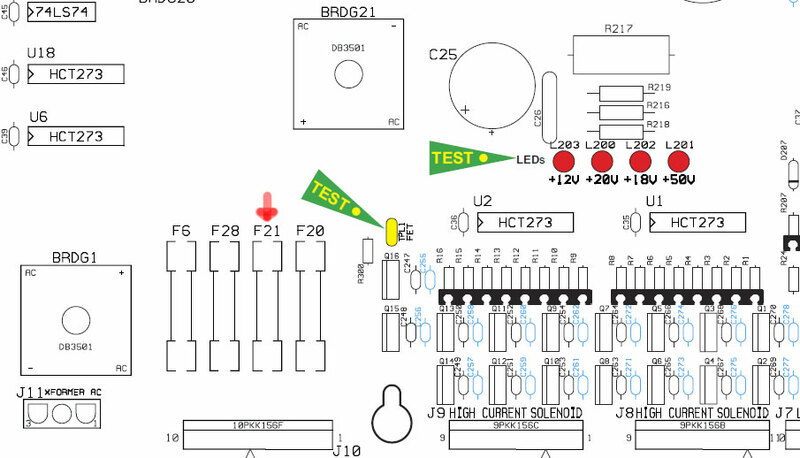 Portion of control board showing F21 and power LEDs (click for full res). 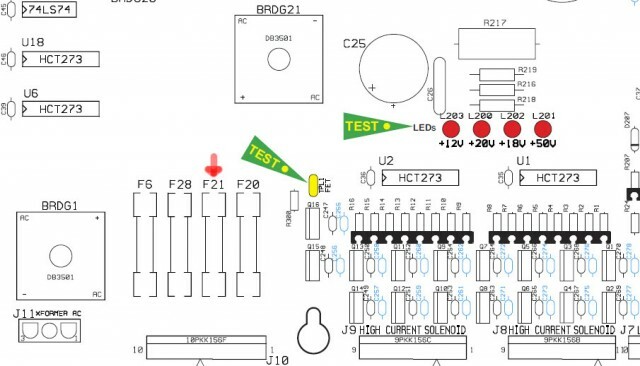 A quick visual check of the various voltages can be made by looking at the bank of power LEDs. I replaced the fuse and the solenoids began working again. I did a coil test from the diagnostics menu to see if there were any problems that would have caused the fuse to blow. I then tested all of the switches. Not seeing any problems, I concluded it was simply what I call a “fatigued fuse”. Fuse fatigue occurs if the current in the circuit exceeds the rated value of the fuse for a brief moment. The F21 fuse is a MDL time delay type of fuse rated at 3 amps. If 3 amps is passing through the fuse, it won’t blow. If 4 amps is passing through it, it will blow within an hour. It can handle 6 amps (double) for up to 5 seconds before it blows. So a fuse like this can handle spikes in current without blowing. But if coil or a drive transistor shorts out, it will blow protecting the circuit. During multi-ball, the flippers and bumpers can energize all at the same time causing current spikes much greater than 3 amps. After years of this, the fuse filament gets weaker and eventually breaks, like a light bulb burning out. Which fuse is blown? The center fuse. See text. The fuse on the left sure looks suspect with it’s black residue. This is a fuse that I took from a high powered coil circuit from a different machine. It still works. It still measures good on an ohm meter. I doubled checked by putting exactly 3 amps through it with my bench power supply. It’s what I would call “fatigued” and probably will blow in the near future. The center fuse is blown, but it’s difficult to tell visually. The fuse on the right is intermittent. It works for 15 minutes then stops. If you turn off the power, it will start working again. It’s the most bizarre behavior I’ve ever seen in a fuse. It had me thinking the loss of power was somewhere else. When it comes to fuses in pinball machines, don’t trust your eyes or your meter. 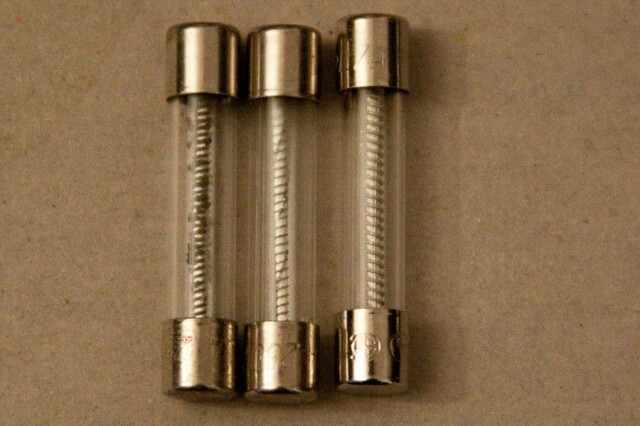 But if the fuse looks like the one on the left, replace it anyway because it’s about to blow.